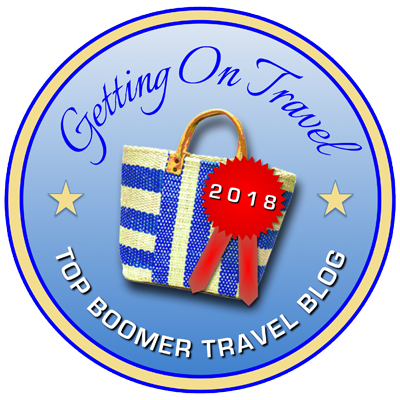 With just a week to go before Christmas, it seems like a good time to mention some gadgets and smallish travel items that are easy to carry but can come in useful on a trip — and which make great stocking-stuffers for the baby boomer traveler on your list. These items all have a few things in common: they’re compact in size, they meet travel needs and wants, and they’re all nicely designed and packaged. In short, besides being useful, practical or in one case just enjoyable, they’re well-marketed. If you have a hiker or camper or other kind of outdoorsy person in mind, this full-size beach towel from Lightload comes in a small 5-ounce waterproof container (pictured) that fits into your pocket or backpack but expands into a towel that’s 36 by 90 inches. It’s absorbent and wickable and can also be used in an emergency for first aid (like a tourniquet), as a scarf in winter, as a beach wrap, or for insulation. The same company makes hand towels that fold up into even smaller containers and are great for day hikes. The next item might have fit into the “paranoia” file a while back, but with the recent NSA revelations indicating that personal privacy may be a thing of the past, and with high-tech passports and credit cards possible targets of prey for skimmers and hackers, you can’t be too careful with your personal and financial data. Hence the Blackout Pocket from Scottevest, which is said to totally block RFID, cell and GPS signals, protecting your cell phones, passports and credit cards from being digitally pickpocketed. Once you drop your cell phone into the bag and close it, you are totally off grid in 3-5 seconds. As a travel bonus, you can even reuse the bag it comes in as a one-quart TSA-approved toiletries bag! The third item might not make it past the TSA security checkpoint at the airport, so I don’t recommend carrying it if you’re flying. Best to drink it at home (or someone else’s home, or your hotel) for a little holiday cheer. You may have seen these skull-shaped bottles of Crystal Head Vodka in the liquor store and wondered, what’s up with that? It seems that actor-comedian Dan Aykroyd, who once performed memorable imitations of Julia Child on Saturday Night Live, is the man behind the brand. Touted as a pure-crystal-filtered “ultra premium vodka,” Crystal Head can be purchased with a Rolling Stones 50th anniversary commemorative gift set, which includes a 750-ml bottle of vodka, a 2-CD compilation of live Rolling Stones hits, a Crystal bottle decanter top engraved with the Rolling Stones lip and tongue logo, and a display case featuring a real zipper (recalling the Stones’ legendary Sticky Fingers album cover). Pictured here, though, is a 50-ml bottle, sans Stones, which works better as a stocking stuffer. Now, in the spirit of the season, because they too would fit into a stocking, I’m going to reprise two new gadgets I featured in an earlier post, both geared toward traveling with smartphones. The first gadget is pretty ingenious: it’s called a Keyprop, from Integral Design. You can use it to prop up your phone so you can read from it, watch videos and or even take selfies (if you download an iPhone app) without having to hold onto your phone. In the shape of a key — it fits on your key ring so you’ll always have it — Keyprop is made of hard rubberized material and comes in a variety of colors like green, red, blue and black. It fits virtually all smartphones by inserting the prong into the headphone jack. Of course, you don’t have to be traveling to use a Keyprop, but I find it particularly handy for that purpose. You can prop up your phone on the tray that pulls down from the back of the airplane seat in front of you, or prop it up on a flat surface to take a picture of yourself from a distance farther than arm’s length (with more stability, too). The latter requires the free KeyCam self-timer app that’s optimized for the iPhone 5. It’s pretty ingenious, too — when you clap, it snaps the picture. Another gadget I travel with holds my smartphone up off the floor while I charge it overnight (or any time) while traveling, usually while staying in a hotel. I often used to have to lay my phone on the carpet of a hotel room because the only available plugs were on a wall with no surfaces below other than the floor. This gadget — called a Cell Phone Holder and Charging Station — hangs over your charger as it’s plugged into the wall socket and has a resting platform for your phone. It’s great as long as you remember where you put it. Nifty stuff, Clark, also classic picture from Santorini. Thanks, Ken, the picture always brings me back to Santorini, where I wouldn’t mind being right now instead of surrounded by snow. Happy holidays!